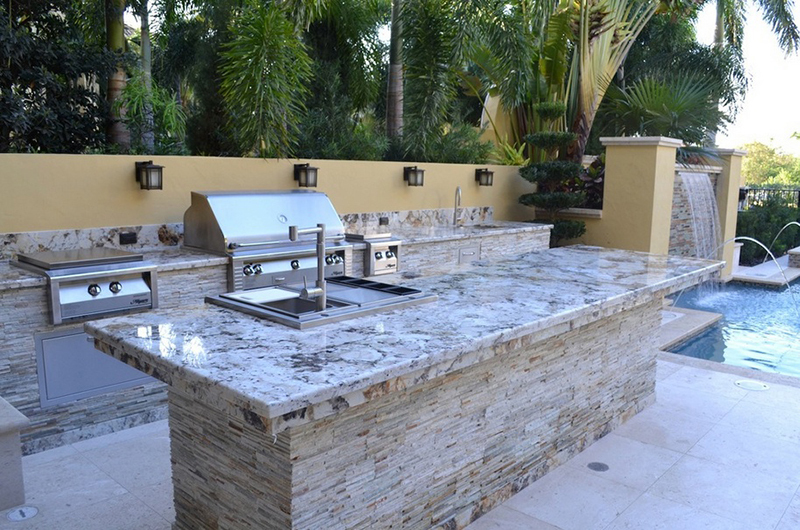 Above all, the material you select for your outdoor kitchen countertops must be weather-resistant. 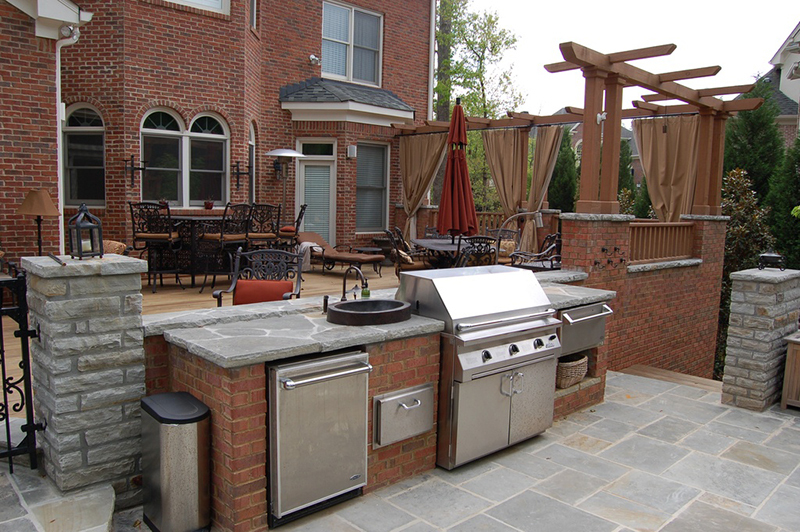 When choosing outdoor kitchen countertops your priority should always be durability first, and looks second. 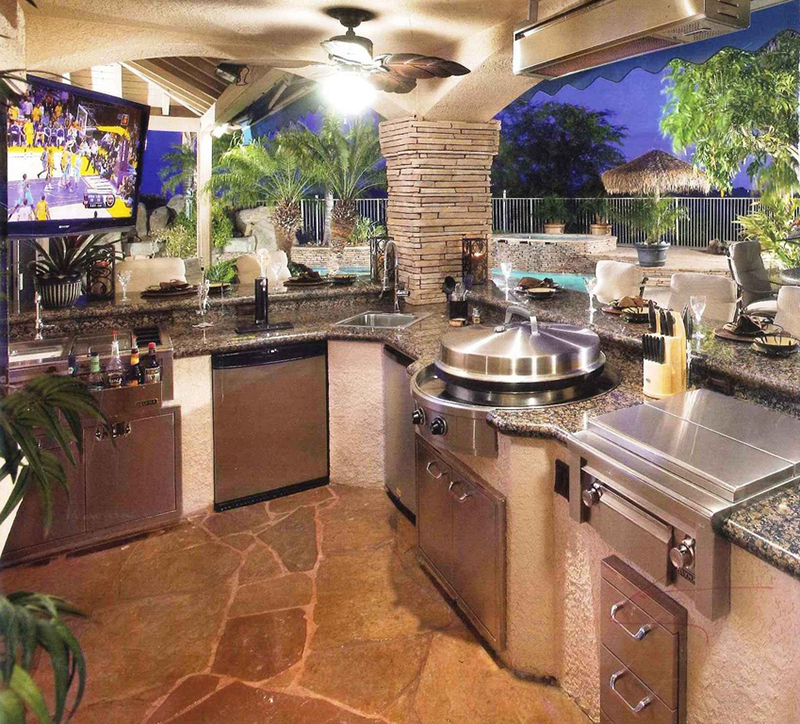 Also, keep in mind that while function plays a more important role in the outdoor kitchen than aesthetics, you’ll want the material you choose to look right within the context of your space. Otherwise, you’ll find your investment going up in smoke. Select a material that will suit the style of your house and your cooking style. 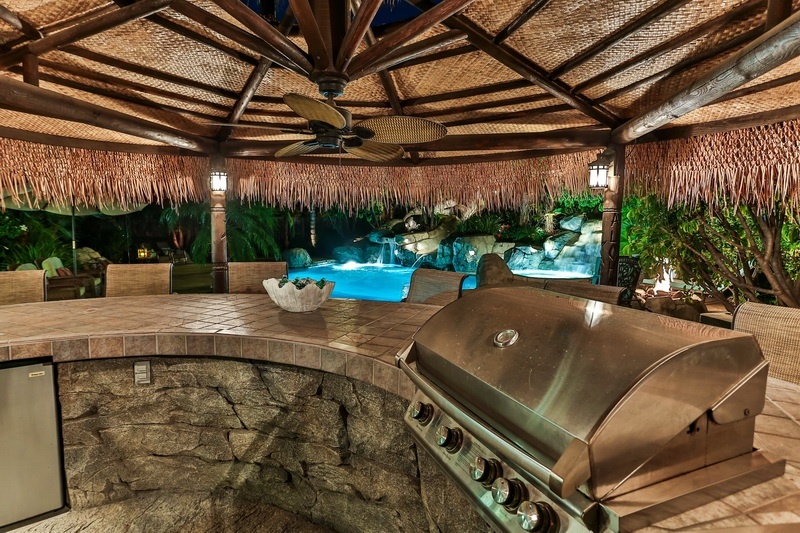 Your best choices are natural stone or tile. If your heart is set on a manufactured countertop like quartz or recycled glass, talk to the manufacturer first. Most use pigments that are not designed to stand up to outdoor use, so if the counter is exposed to UV rays the color may change over time. There are many types of stone, and you can use any of them on your outdoor countertop, but should you? Porous stones like marble and limestone may look great at first, but they stain easily, so you may be left with counters marred by grease or wine. Granite is the toughest option. It stands up well to the elements, doesn’t absorb stains or odors as easily as other stones, and shouldn’t fade in the sun. If you prefer the matte finish of limestone have your granite honed, instead of polished. Choose a mid-range color. Darker stones will absorb heat and you can burn your hand if you touch a really hot countertop. 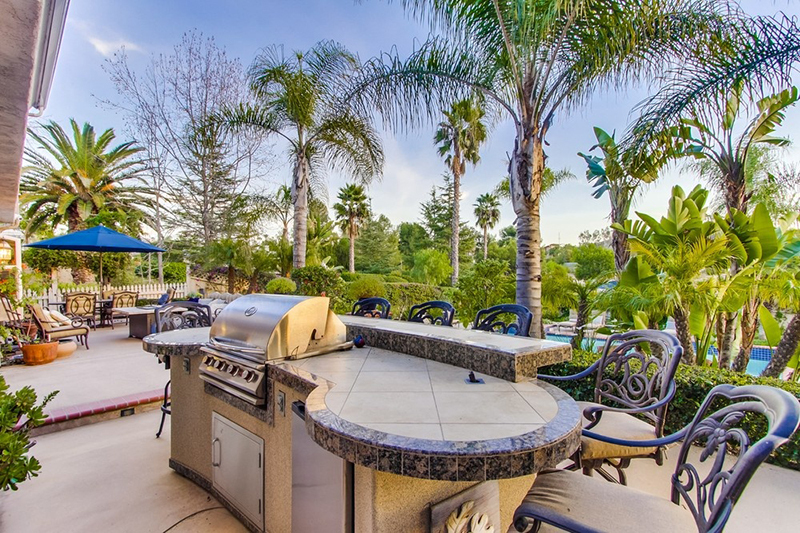 It can handle the weather and all the fancy barbeque recipes, food, drinks, fun (and sometimes chaos) of outdoor dining and entertaining. It won’t etch, or discolor, or lose its shine. Sealing granite countertops is a good idea to prevent stains. However, this is not complicated… easily done. So with normal clean-up, granite countertops will look great for years. 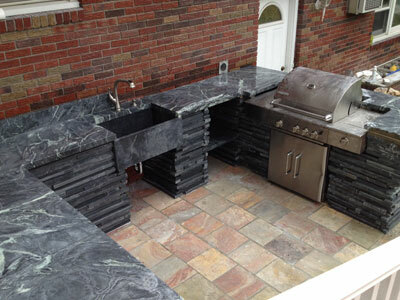 Soapstone countertops are a good pick for an outdoor kitchen design. 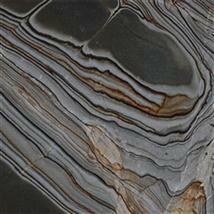 Soapstone is highly resistant to heat and staining and will perform well. It can be scratched rather easily; however, scratches are easily repaired too. One knock on soapstone is that when left unsealed or not oiled (neither of which are necessary for protection or maintenance) fingerprints, liquids and oils will darken the stone. They will eventually wash off, but the spots and splotches can be annoying. You can apply oil to give soapstone that dark shine, but you have to apply it regularly to maintain that look. Soapstone is durable though and low maintenance except from a cosmetic standpoint. Tile offers the widest range of style options. You can go with an ornately patterned style, or a stone look, or just about anything in-between. It’s frequently affordable, and it’s the easiest do-it-yourself surfacing material of the bunch. But if you live in a cold climate, the freeze-thaw cycle puts the grout and tiles at great risk of cracking. Also, grout stains, even when it’s been sealed. If you decide to go the tile route, choose freeze-proof tiles, use dark grout, and hire an installer who knows the business very well. He or she will use products appropriate for you climate, and can instruct you on proper care.